It has been a rollercoaster of a year. Many of my books and games sold out at GenCon and the reception for anthologies like New Hero and Haunted: 11 Tales of Ghostly Horror has been fantastic. Not to mention, work in general has been fantastic. John and I will be releasing some exciting news and one of my favorite Munchkin accessories just went to print — the Munchkin Duck of Doooooom. Now, I’m just about to hop on a bus to ChiCon in Chicago where I’ll have a reading and be milling about with friends and (hopefully) new ones, too. First things first: the rumors are true. I’m working on a proposal for The Queen of Crows as an RPG. I’ll be using Kickstarter to test the efficacy of this idea. Second, I’ve gotten a fair number of responses for The Thirteen, but there’s still time to put in your application. Friends are going to be excluded from this for professional reasons. Acquaintances are a different story, however. Once I get back from ChiCon, both John and myself will be attending Geek*Kon as a guest the following weekend. Then, I don’t have any professional travel planned for a month and a half. I’m behind on some projects; ahead on others. I’ve been through every emotion on the face of the planet with respect to writing on “spec” and diving into novels — there’s nothing else for me to rant about, be afraid of, or process. Now it’s time to move forward in the kindest, gentlest way possible and spend time only on what I can afford to so I can balance other pleasantries and necessities that have fallen by the wayside. There is only so much care I have in the world and most of that is related to my words right now. I either do this now, or I give up. I can’t do that, because I am immersed in dreams that won’t stop haunting me. Real, tangible visions about what I want to do — and I think it’s possible. With time and a hell of a lot of hard work. In the meantime, I’m enjoying the hell out of the ride. I am pleased to announce that I am attending WorldCon this year for the first time in Chicago. This, for me, is mostly vacation, an excuse to hang out with new (and old) friends, and a way to drown myself in awesome stories. Thankfully, Kodama (my netbook) is extraordinarily portable and has a long battery life so I can still write on the road. This year, I’m two panels and I also have a reading. In addition to these events, I will be spending some time as a booth volunteer for my friend Jason Sizemore from Apex Publications on Friday from Noon to 4 p.m.
Steve Jackson (from Steve Jackson Games) will also be at the convention along with a host of other people from the gaming industry including Matt Forbeck and Kenneth Hite. I’m looking forward to hanging out with some friendly faces. Should be a great time for all! Has your story fizzled out or hit a wall before completion? There are common reasons for this, and common solutions which work for most writers. Pros discuss their tips and tricks for getting a story back on track. I’ll be reading excerpts from “Tomorrow’s Precious Lambs” and “Tailfeather,” which were stories published through Apex Publications. I am strongly considering the addition of chocolate or some other confection, because really… what reading shouldn’t have some sugar?!?! Discussion on what are the ethics of book reviewing? What biases or conflicts of interests need to be divulged? What kinds of statements are not appropriate? Is it OK to review a book by a personal friend (or an enemy)? This year, for GenCon, I will be working in my capacity as Marketing Director for Steve Jackson Games. We have a giant eye-in-a-pyramid at the top of our booth so you can’t miss us in the Exhibit Hall. If you don’t spot that, we’re listed as Booth #1301 in the program book. This is my first fan-facing convention for the company and I’m pretty excited about it. I coordinated a Munchkin Apocalypse preview contest on Twitter and the winners will be sitting down with the Munchkin Czar, Andrew Hackard, to play this upcoming release. (Hint: we also have a capsule machine in our booth and the last golden ticket… Er… seat will be won there.) There are also a ton of signings, interviews, and announcements planned. On Wednesday, I’ll be headed to the Diana Jones Awards and am very anxious to see all my friends. Then, on Friday I’ll be representing our company for the ENnie Awards. Both of our submissions, GURPS Horror Fourth Edition and GURPS Social Engineering, were nominated for a total of four awards. There’s a ton of great games and supplements nominated; I’m sure it was very tough for fans to decide the winners. And now, I pause for a bit of self-promotional awareness. The first is at the IPR Booth #2120 on Saturday from Noon to 1 pm for Don’t Read This Book, the anthology published by Evil Hat Productions for the Don’t Rest Your Head RPG. My second signing takes place at the DriveThruRPG Booth from 11:00 to Noon on Sunday, August 19th. I’ve been told there’ll be a ton of publications new and old at their booth including print copies of: Strange, Dead Love for Vampire: the Requiem, Falling Scales Part II, Exquisite Replicas, The Queen of Crows, Haunted: 11 Tales of Ghostly Horror, Redwing’s Gambit, and quite a few other stories, games, and supplements! At the same time, Stone Skin Press, the new publishing arm of Pelgrane Press, will have a signing for their new fiction line. 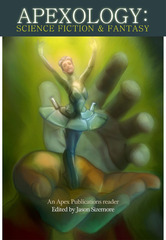 I contributed to the New Hero anthology and The Lion and the Aardvark collection of fables. Truth be told, there was only so much of me to go around this year. There’ll be other 2012 releases I’ve worked on debuting at GenCon, so be sure to review my latest publications or drop back for a post-GenCon update. 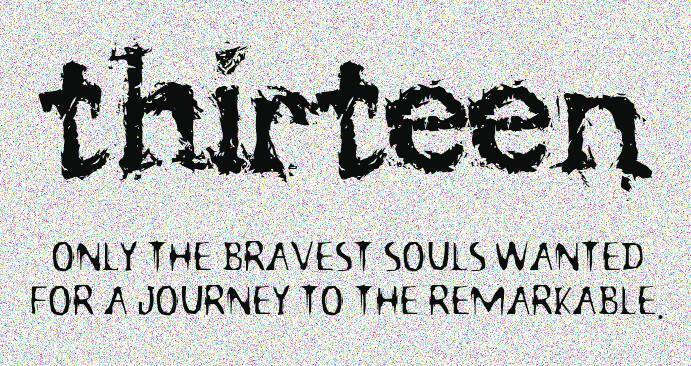 Are You Brave Enough To Be One Of My Thirteen? When I released The Queen of Crows, many readers said I was fearless. Now, I am opening up my author’s door for you to do the same. I am asking thirteen brave souls to be hands-on participants in my journey as an author. If you’ve read my work and know my reputation, you understand that I strive to be professional at all times. With that desire, coupled with many years in business, comes certain limitations. For example, this group will not include any media/tie-in or any contract work I do for professional reasons. This experience will be more intimate than what I can offer online or in person. Here, you will get an inside look at my writing and research process similar to what you saw in The Queen of Crows. Your voice will be heard. You will be able to provide comments and feedback on my original un-submitted work. And I will talk to you about my manuscripts in a way that I do not do with anyone else. You will not only see my joy, my passion for writing, and my disappointments — you will experience them first-hand. You’ll be notified first of any upcoming publications, whether you’ve read that particular story or not. You’ll receive an annual Thank You present that’ll include some of my stories and other niceties. You’ll be acknowledged, whenever possible, for your feedback. That means if you comment on one of my novels or novellas, you’ll get publicly thanked in the book. Space is limited to a maximum of thirteen souls. Other perks may be announced as the group comes together and identities are revealed. Interested? Please contact me and give me a few sentences about yourself including what you like to read and a website if you have one. If you are a writer, please mark that in your description. Have questions? Please post them in the comments below so I can follow up with a FAQ sometime next week. My research for The Queen of Crows took me into strange places and taught me that things you or I may take for granted are hallowed to others. As a result, one of the driving forces behind the main character, was the idea of ultimate self-sacrifice. Inspired by a true story, the main character goes to terrible supernatural lengths to help his tribe, but the reality is that there’s typically only one resource that can help. Money. Link to the IndieGoGo fundraiser is here. Link to the press release is here.